Double-win for new and innovative health & fitness coaching facility, offering integrated personal training, nutrition coaching, injury recovery and sports massage, all under one roof. INTENTIO is a different kind of gym - dedicated to helping our members meet their health and fitness goals through a combination of personal training, nutrition, physical wellness, and a lot of support and encouragement. INTENTIO Fitness Coaching, a Mountain View-based personal heath coaching facility is pleased to announce that it has been selected as the winner of two “Best of Mountain View 2016” categories – Best Personal Trainer, and Best Nutrition/Weight Loss Program. 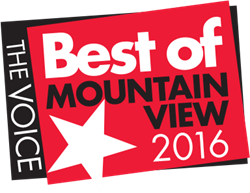 “Best of Mountain View” is an annual survey of local residents from Mountain View and the surrounding area, coordinated by the Mountain View Voice. Every year, Mountain View Voice asks their readers to vote for their favorite places, as a guide to the very best that Mountain View has to offer. Located close to downtown Mountain View, on Moffett Blvd, INTENTIO’s well-appointed fitness facility serves clients looking for personal 1-1 coaching and small-group training, away from the treadmill-farms and impersonal face of big-box gyms. INTENTIO was established in July 2015, and in one short year has developed a strong reputation for it’s excellence in improving health by way of a signature program created by the INTENTIO team. By combining the expertise of individual coaches across the fields of exercise, nutrition and recovery, INTENTIO is able to offer whole-body health coaching. INTENTIO works with its clients to define their health goals (their INTENT), and together they build a training program and nutrition plan, plus provide support and accountability to meet or exceed their client’s objectives. INTENTIO is celebrating this award by offering a $400 discount, plus a free sports massage, for new clients signing up for a six-month personal coaching program. Contact info(at)intentio(dot)com for more details and set up an initial consultation. INTENTIO is a different kind of gym. We are dedicated to helping our members meet their health and fitness goals through a combination of personal training, nutrition, physical wellness, and a lot of support and encouragement. By taking a whole health approach to your training, we not only enable exceptional and enjoyable results, but we also help instill positive habits and behaviors that will put you on track for a lifetime of physical success. For more details, contact us at info@intentio.com, visit us at http://www.intentio.com.